Net income per employee (NIPE) is a measure of productivity and efficiency, determined by dividing net income by total employees. I like this metric as it puts an emphasis on the return on talent, arguably a company’s most valuable asset. Additionally, in an increasingly digital economy, return on invested capital (ROIC) becomes a bit less of a complete metric, as more and more intangible assets are created by employees, offering a rich source of future value. The last benefit of weighing NIPE is that it requires no accounting adjustment, making the metric less ambiguous (re: depreciation/amortization on capital investments) and easier to benchmark against competitors operating in the same industry. What industries have the highest/lowest NIPE? 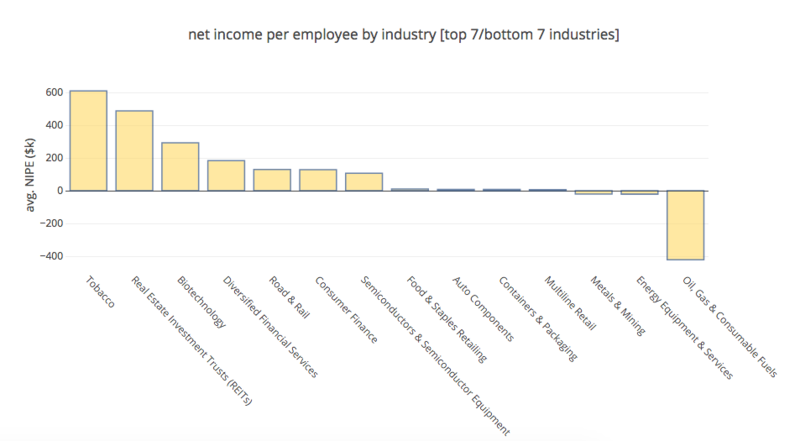 The below chart shows the average NIPE for the top 7 and bottom 7 industries of the 500 largest public companies. 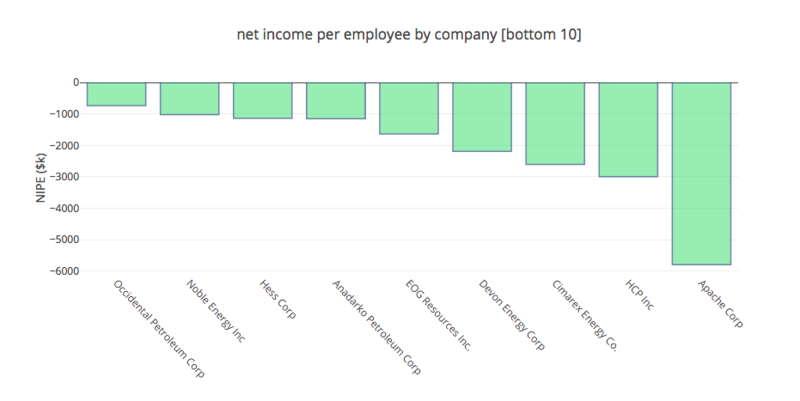 As you can see, Tobacco, REITS, and Biotechnology top the list, with the 3 Tobacco companies included bringing in an average of $609k per employee. Conversely, Oil, Gas, & Consumable fuels have had a rough year as the price of oil continues to tank, losing an average of $421k per employee! What companies have the highest/lowest NIPE? Next I split out the top 10 and bottom 10 companies in terms of NIPE. Here we see the ~240 employee REIT Host Hotels & Resorts Inc tops the list, and Reynolds American represents the Tobacco industry coming in at #7. Next, I pulled the bottom 10 companies by NIPE. Energy companies, not surprisingly, top the list, with all listed operating in Energy sector less HCP Inc, who operates as a REIT investing primarily in healthcare facilities. (looking into HCP this I see they made over $1.4b in investments last year, driving net income negative, normally operate at ~$1bb/year profit margin). 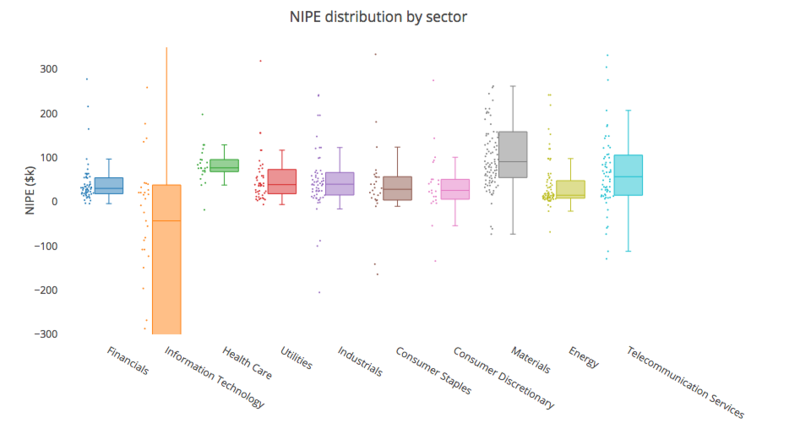 Lastly, I split out the distribution of NIPE by sector. Below we can see the crazy variance in the Energy sector, along with high variance in both Financials and Information Technology (Yahoo, Twitter, LinkedIn were some of the negative N/Is). I used Fidelity’s stock screener to grab the data (you have to have an account to pull most metrics). The financial data, per Fidelity’s setup, spans a rolling 4 quarters, with 2016 Q1 reports included.